"My best friend and I make this every year on New Year's Day, and it's so delicious! We always serve it with homemade cornbread, black eyed peas, Champagne, and ham. Happy New Year, everyone!" Heat oil in a large pot over medium heat. Add onion, green pepper, and garlic. Cook and stir until browned, about 5 minutes. Add pork, Creole seasoning, and salt. Cook until pork is browned, 5 to 7 minutes. Do not drain. 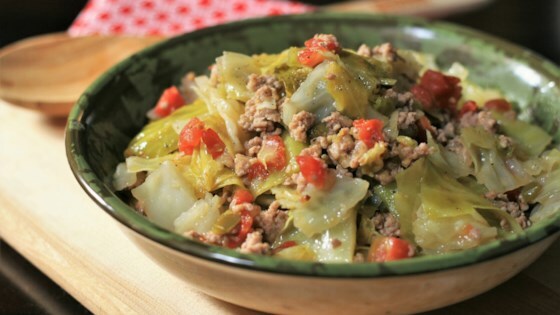 Arrange cabbage over pork; cover with diced tomatoes. Add lid and reduce heat to medium. Cook, without stirring, until cabbage is wilted, 15 to 20 minutes. Stir and taste for seasoning. Substitute ground beef for the pork if desired. You can use the whole can of RO*TEL, if you like. If you're not using Tony Cachere's® seasoning, more salt may be necessary. This is what I need to get my family to eat cabbage. A great recipe.